There are five important investment process questions to ask before buying a low-volatility fund. Well-constructed low-volatility stock funds should offer better downside protection, a smoother ride and better risk-adjusted performance than the market over the long term. But not all low-volatility funds are created equal. Differences in how they are constructed can affect performance and their odds of success. It's important to have a strong framework to evaluate how these funds are built. Alex Bryan, CFA, is director of passive strategies for North America at Morningstar. Before assuming his current role in 2016, he spent four years as an analyst covering equity strategies. He holds an MBA with high honors from the University of Chicago Booth School of Business. 1) What's the selection universe? The selection universe is the fund's starting point, or parent index. It should serve as the benchmark against which you gauge the fund's risk and risk-adjusted performance. It can also offer insight into the riskiness of the fund itself. For example, large-cap stocks tend to be less volatile than small-cap stocks, so the most risk-averse investors should probably stick to low-volatility strategies that draw exclusively from the largest stocks. That said, the performance improvement from tilting toward low-volatility stocks tends to be the greatest in the small-cap arena. 2) Does the fund consider each stock's volatility in isolation, or does it account for how stocks interact with each other in the portfolio? The former approach yields greater exposure to the least-volatile names in the selection universe, more closely capturing the low-volatility effect documented in the academic literature than the latter, more holistic approach. That said, it can also lead to a less diversified portfolio that loads up on a few sectors or stocks that may have common exposure to other risk factors, like interest rates. This can introduce risks that past volatility alone does not capture. The holistic approach to stock selection is probably more suitable for a fund that serves as a core holding. No measure of past risk is perfect. Incorporating correlations across stocks in the portfolio construction process improves diversification, which helps mitigate the damage if the riskiness of the fund's holdings picks up. So, even though these portfolios may have less exposure to the least-volatile stocks than funds that key on individual stocks' volatility, they may actually have less volatility at the portfolio level. The knock against funds that use this approach is that they're more complex and typically rely on an opaque optimization process to build their portfolios. 3) How does the fund measure volatility? The most common statistical measures of risk that low-volatility funds use to select stocks are standard deviation of returns and market beta. Some also include fundamental measures of risk, such as volatility of earnings or leverage. However, one approach isn't necessarily better than the others; while incorporating fundamental measures of risk can paint a more complete view of risk, they can also dilute the portfolio's exposure to the least-volatile stocks in the market. It is more important to focus on the period over which low-volatility funds measure risk and whether they measure each stock's risk relative to its sector or the entire universe. Stocks' volatility relative to each other tends to persist, but that persistence has historically been strongest in the short term. Funds that use a shorter lookback period (like a year) to measure volatility and rebalance frequently should be able to get out of the way faster if volatility in a particular area of the market picks up. So, they should be able to better reduce volatility than funds that use a longer lookback period. The downside is that they tend to have higher turnover, though the benefits should outweigh the costs. Measuring each stock's volatility against its sector peers can help reduce sector tilts relative to the market, which can be a source of uncompensated active risk that isn't necessary to capture the low-volatility effect. However, this approach also tends to give a fund greater exposure to more-volatile sectors, like materials and technology, than targeting stocks with low volatility relative to the entire selection universe. Despite this trade-off, it is prudent to have some constraints on sector bets either through explicit sector limits or sector-relative stock selection. Large sector tilts are a source of active risk that are not necessary to realize the benefits of a low-volatility strategy. 4) Are there any portfolio constraints? While constraints like limits on sector, country and stock weightings and non-targeted factor exposures can reduce a fund's style purity, they often help more than they hurt. Such constraints can improve diversification, mitigating potential losses if particular sectors or holdings fall out of favour. Turnover constraints are less important, but they can help modestly reduce transaction costs. 5) How frequently does the portfolio rebalance? More-frequent rebalancing (quarterly or monthly), coupled with a short volatility measurement period, should help a low-volatility strategy get out of the way faster as the volatility of its holdings increases. This should translate into a greater volatility reduction. Rebalancing frequency doesn't move the needle as much with a long lookback period. Let's apply this framework to take a closer look at six defensive equity strategies. Exhibit 1 summarizes each fund's portfolio construction approach. 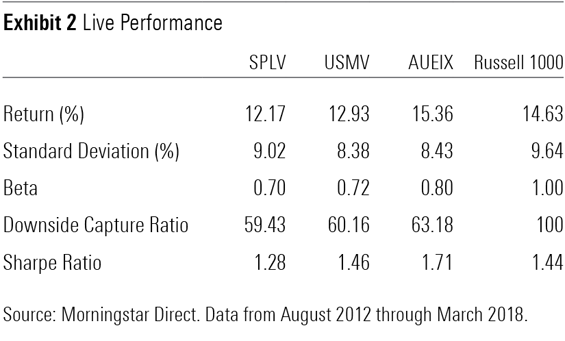 Invesco S&P 500 Low Volatility ETF (SPLV) is the simplest of the six funds. Each quarter, it targets the 100 least-volatile stocks in the S&P 500 over the past year and weights its holdings by the inverse of their volatility. Its frequent rebalancing, short look­back period, focus on absolute (rather than sector-relative) volatility and high hurdle for selection give it clean exposure to the low-volatility effect documented in the academic literature. However, its lack of sector constraints often leads to large sector tilts, which are sources of risk that detract from the fund's appeal. It earns a Morningstar Analyst Rating of Bronze and is also available in a Canadian-listed version, which trades in Toronto under the symbol ULV.F. SPDR SSGA U.S. Large Cap Low Volatility Index ETF (LGLV) follows a similar stock-ranking and volatility-weighting approach to SPLV. However, it uses a longer lookback period (five years) and rebalances only once a year, so it won't detect changes in volatility as quickly as SPLV. And it measures each stock's volatility relative to its sector peers, targeting stocks representing the least-volatile 30% of each U.S. stock sector by market value. This helps it avoid the large sector biases that SPLV exhibits. Fidelity Low Volatility Factor ETF (FDLO) is very similar to LGLV. The biggest differences are that this fund relies on more data points to select the most-defensive stocks in each sector, adjusting them to mitigate size bias relative to the selection universe, and it weights its holdings by market capitalization. This gives it a much larger market-cap orientation than LGLV. IShares Edge MSCI Minimum Volatility USA ETF (USMV), which also comes in a Canadian version (XMS), takes a more holistic approach to portfolio construction. 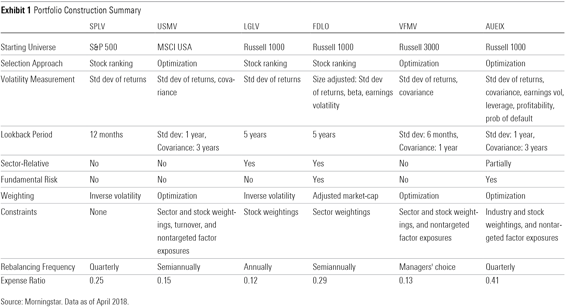 It uses an optimization framework, which takes into account both individual stock volatility and correlations across stocks estimated from their factor exposures, to build the least-volatile portfolio possible under a set of constraints. These include limiting turnover and sector and stock tilts relative to the starting universe, as well as exposure to nontargeted factors. This results in a well-diversified portfolio that still effectively captures the low-volatility investment style, earning a Silver rating. The fund gives greater weighting to more-recent return data, primarily focusing on the past 12 months for volatility and three years for covariance. This approach and the fund's semi-annual rebalance allow it to effectively adapt as risk in the market changes. Like USMV, Vanguard U.S. Minimum Volatility ETF (VFMV) relies on an optimizer to build the least-volatile portfolio from the stocks in the Russell 3000 Index. This all-cap starting universe gives this fund a smaller market-cap orientation than USMV, which could help performance because it improves diversification. It also allows the fund to take advantage of the low-volatility effect in the small-cap arena, where it has tended to work the best. This fund focuses on more-recent data than USMV to estimate stock volatility and covariances, which could increase turnover, but also helps the fund pick up changes in risk faster. While this strategy is rules-based, it is actively managed and does not follow a pre-set rebalancing schedule. The managers rebalance the portfolio when they believe the benefits of trading outweigh the costs. AQR Large Cap Defensive Style (AUEIX) is also actively managed. It combines fundamental and statistical measures of risk in an optimization process that considers the interaction across stocks. AQR places greater emphasis on how each stock's fundamental quality traits stack up against its industry peers than against the entire universe. However, it does not take a sector-relative view of statistical risk, which it measures over the same horizon as USMV. 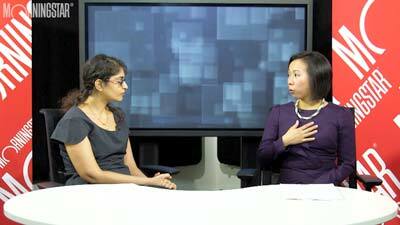 The fund constrains its industry weightings. However, it applies those constraints to an equal-risk-weighted version of the selection universe, which gives greater allocations to less-volatile sectors. So, while it can exhibit meaningful sector tilts, the fund still effectively diversifies risk. We have only five-plus years of live performance data for three of these funds in their current form. Despite their differences, all three funds exhibited slightly lower volatility than the Russell 1000 Index from August 2012 through March 2018 and tended to hold up better during down months, as expected. All six funds have a reasonable chance to exhibit lower volatility and better risk-adjusted performance than their parent benchmarks over a full market cycle. However, those that constrain their sector weightings and use a short lookback period to measure volatility are more appealing. These include USMV, VFMV and AUEIX.